*Not to be confused with this Uncle Eddie. Well, it was a good idea. But pretty much noone eats my vegan cookies and gets away with it. They don't deserve Bummo. Good idea, but sad we'll never see Bummo. It's like totally intelligibel, though. It's good to read new blogs by you, as well. I kinda missed them. Aw. Poor Bummo. He would have been awesome. Because we'll never see Bummo... I vote the Tar Pits. No Bummo? What a shame. Oh and poor cookies. They belong in your stomach, not theirs. Too funny! Maybe I'll be Bummo for Hallowe'en. Poor Bummo. May he rest in peace in rock and roll heaven. If you ever end up in Kiss I don't think the world could handle the awesome. And what's up with other celebs always stealing the vegan treats? hasn't that happened a few times before? Come on Hunter, even if you don't want to be Bummo in Kiss because of the band's thievery, Bummo would make a great Halloween costume. Consider it. Sad day! Bummo would've been awesome! Too bad they just HAD to eat your cookies! What a bummer, he's so awesome. Shame on them for taking your cookies! They ate your vegan cookies without asking?! Those jerks! Oh well, their loss. They don't deserve Bummo. It's a bummer that Bummo won't see the lights of the stage... but please reconsider your decision, the cowbell is a great instrument!!! Cowbells and Psychedelic (like your iphone, lol) rock do get along. Gene and Paul ate your cookies? Last time you were in the studio didn't Paris Hilton eat Davey's birthday cake? Maybe you should keep your food in a secured area. As for Bummo, he would just be an employee of Gene & Paul and never rake in the real money. i never knew you were so artistic Hunter! or alternatively, AFI could just pick the lazy option by pushing KISS into a nearby pool and dragging you back to the band by the ankles! LOL! Oh KISS. I think it's time to give up the ghost. As far as I'm concerned, KISS = James Joyce. Interesting artifact, not worth paying money to experience viscerally. Would I shell out $150 to hear Joyce drone out some of the Aeschylus-style frog croaks in Finnegan's Wake? Hey now, just 'cause I was born in the morning doesn't mean I was born THIS morning. Hunter, do you know what just came to my mind? Omgsh, What if I made a Bummo shirt and wore it in front of KISS? Haha, my dad likes that idea. I liked the idea of making a new KISS member anyways. I say he should play cowbell so Christopher Walken can yell at him, "I have a fevah! And the only prescription is more cowbell!" And shame on KISS for eating your food! You should totally dress up like that for an AFI show. Uncle Eddie's Cookie are pretty rad but I don't think, I'd be super upset over losing them. I would freak if someone ate a bag of my Mighty O Donuts. ...well look whose blog I just found! i might not want to eat those cookies. How rude of them! >=[ I still think you should have gone for it though! 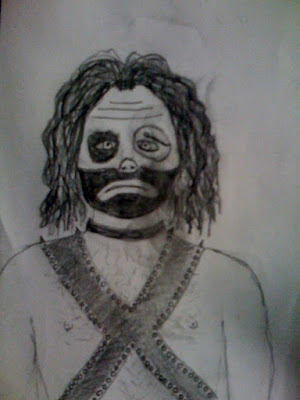 I can not believe you mentioned Emmett Kelly in a blog....I can't believe that anyone would! LOL!!! I grew up in the same town he was from...rodeo clowns are like a big deal there! LOL!!! They even have an Emmett Kelly museum! LOL!!!! Just thought that was funny...too bad about Bummo though!